Dr Jane Goodall releases two endangered Bali Starlings in a symbolic gesture at the second ever graduation of Green School’s High School Students in 2014. The moment marked the end to a seminal four days at Green School in which the honoured British author, primatologist, ethologist and anthropologist gave one public lecture and one graduation keynote address, hosted an exclusive coffee morning and special fund-raising dinner, presented at two press conferences, and spent a day meeting with all the students of Green School. The children showed their appreciation at a special assembly when they performed a song, especially written for her called A Tribute to Dr. Jane Goodall, DBE: Roots Go Down. 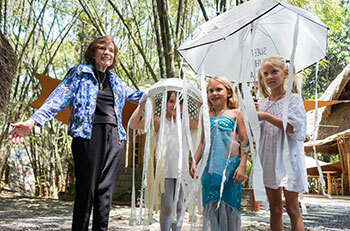 Dr Goodall was in Bali to promote her Roots & Shoots Programme and spread her message of hope. The theme of all her talks centred around the premise “everyone can make a difference every day”. The planet is in a perilous state and it is this generation of children who will, and can, change the world for the better. The Roots & Shoots Programme, of which Green School is a part, is now in 126 countries with over 150 000 active groups doing what they can “to put it right”. This success is testament to her “obstinate” character which she says means “she never gives up”. Each of Dr Goodall’s presentations were layered with anecdotes which, despite her lilting unassuming very British delivery, culminated in a deliberate call to arms. 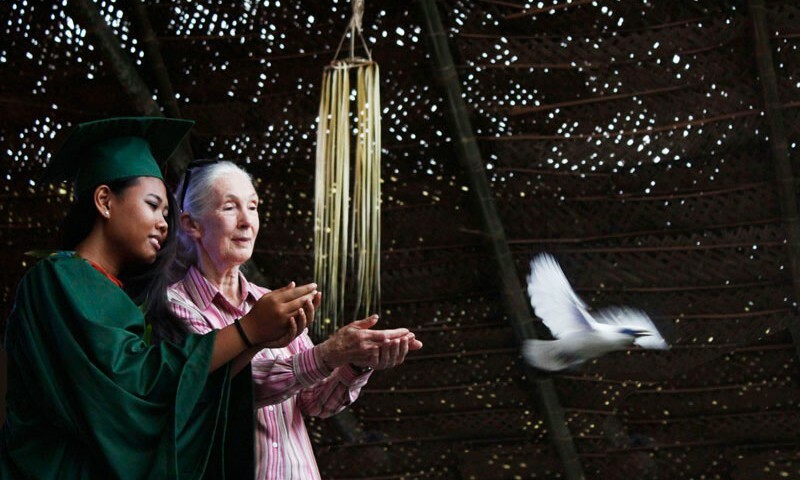 She spoke of how her time in the hen-house as a child taught her the patience required for scientific observation, of the love she had for Doctor Doolittle, who could speak to the animals, and of how “Tarzan had married the wrong Jane”. She acknowledged how lucky she was to have a wonderful mother, who had encouraged her to go to Africa to take such risks while living with the Chimpanzees of Tanzania. Dr Goodall spoke of her mentor, Louis Leakey, Kenya’s National Museum Director, who funded her research in Tanzania and later her Cambridge degree in the 1960s, as well as the other important teacher in her life, her dog Rusty. Rusty had taught her animals did have emotions and personalities. This knowledge had given her the strength to stand up to the Cambridge establishment who criticised her for anthropomorphising the chimps under her watch. In 1992 she had her “Road To Damascus moment” when she attended a conference in Gombe Stream National Park. She learned about the extent of the devastation happening in the African environment with regards to the degradation of its land and animals. She feels a sense of shame and desperation as a member of her generation, having caused such destruction, she says. It is the children who will change their parents’ minds about the problems of poverty, unsustainable lifestyles and the human population. I visited Bali this past summer and loved it. The message that you are spreading about the need to change the environment for the better and that there is hope inspires me. I especially love that you said that every person can make a difference every day. I really enjoyed the videos you shared as well. The children seemed to truly enjoy your lessons. It’s great that you shared personal stories and information in order to connect with the students. I found your blog interesting, inspiring, and informative. I hope I can do more to help the environment or educate young children to care for the environment.